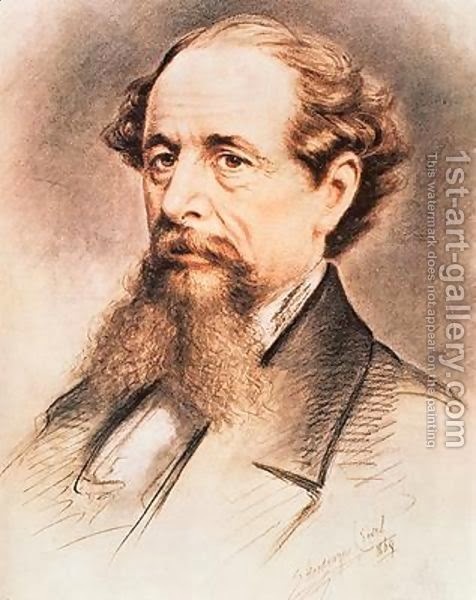 Charles Dickens was born on the 7th February 1812 and at the age of 12 years old he was put to work in a blanking factory to assist the family income as his father was imprisoned in the Marshalsea for debt. From 1824 until 1827 Dickens studied at Wellington House Academy, London. 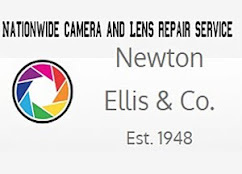 During the period 1827 to 1828 he was a law office clerk, and then worked as a shorthand reporter at Doctor's Commons. In the 1840s Dickens founded Master Humphrey's Clock, a weekly periodical edited and published by Charles dickens between April 1840 and December 1841. and edited the London Daily News. Dickens's had a relationship with Maria Beadnell, the daughter of a banker, which lasted for four years, however, he married the daughter of his friend George Hogarth, Catherine Hogart in 1836. His first novel Pickwick Papers was serialised between 1836 - 1837. It was shortly after this that he made his first visit to Liverpool. It was in November 1838.
" 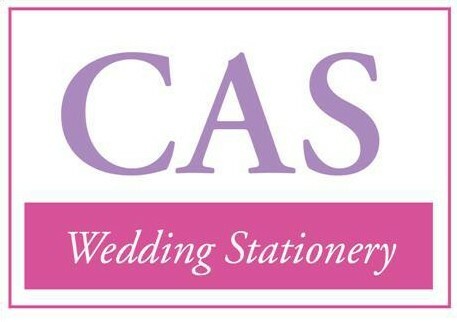 I wrote you last night but by mistake the letter has gone to heavens knows where in my portmanteau. 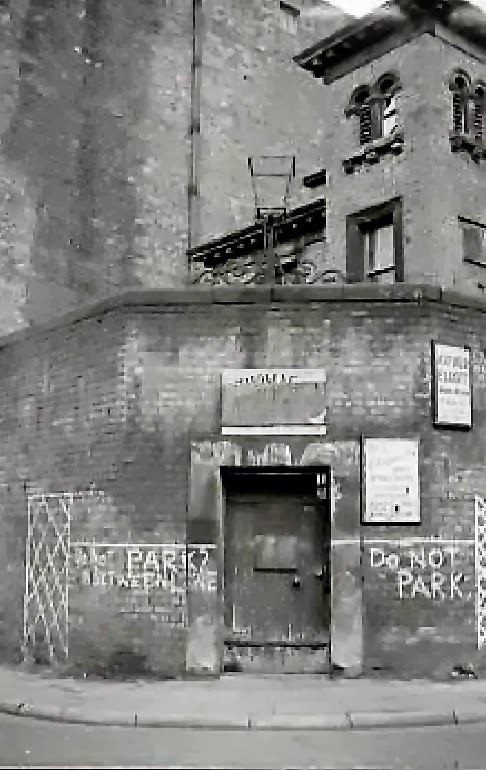 I have only time to say go straight to Liverpool by the first Birmingham train on Monday morning, and at the Adelphi Hotel in that town you will find me" he was aged 26 and this was his first visit to Liverpool. Dickens came to Liverpool many times, the frequency of his visits reflecting not only his undoubted attachment to the place he once described as ‘that rich and beautiful port’, but also Liverpool’s importance in the 19th century as a centre of trade, commerce and travel. As well as his public readings in the city, he delivered speeches there and appeared in theatrical performances. He appeared as a performer at the Theatre Royal, Williamson Square, on 28th July 1847, and appeared in 'Every Man In His Humour' an amateur performance which also included John Forster in the cast. 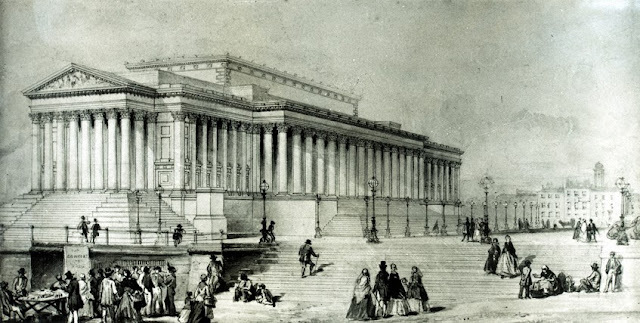 The city at that time was going through a major transformation, work had started in 1842 on St George's Hall, on Lime Street, and Charles being a regular visitor to the city would witness the changes during his trips. Dickens’s first readings in Liverpool were at the Philharmonic Hall, though his favourite venue was St George’s Hall. 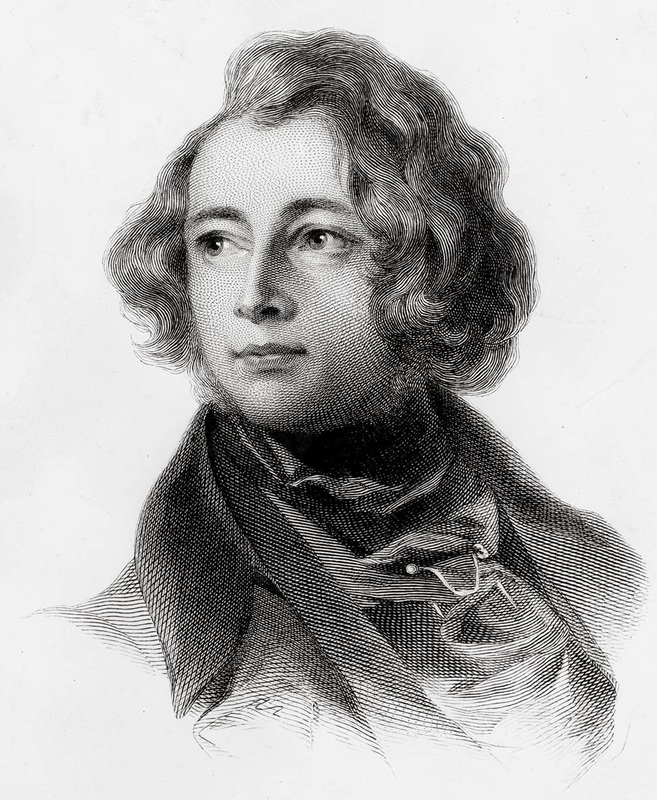 George Dolby, who organised Dickens’s later reading tours, says in his memoir Charles Dickens As I Knew Him that Dickens always spoke of it as ‘the most perfect hall in the world’. Dickens would perform in the small concert room and Dolby’s book includes a vivid account of an appearance there in 1866. It formed part of a lengthy tour, with Dickens giving five more readings in Liverpool than anywhere else except London. Before the first performance ‘enthusiasm had reached the highest pitch’ and the hall was besieged by a huge crowd, so that ‘it looked at one time as if those who had tickets could not get in, and those who had no tickets could not get out’. The police managed to restore order and reported afterwards that over 3,000 people had been turned away. 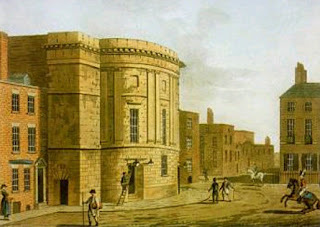 In 1860 Dickens again found himself in Liverpool this time as a researcher on the book, 'The Uncommercial Traveller' which he started in 1859, during this visit Dickens joined the Liverpool Police Force, as a special constable where he would roam the area of the docks he, used this experience in Chapter V, 'Poor Mercantile Jack' for the character 'Mercantile Jack'. "I had entered the Liverpool Police Force, that I might have a look at various unlawful traps which are every night set for Jack. As my term of service in that distinguished corps was short, and my personal bias in the capacity of one of its members has ceased, no suspicion will attach to my evidence that it is an admirable force. Besides that, it is composed, without favour, of the best men that can be picked, it is directed by an unusual intelligence. 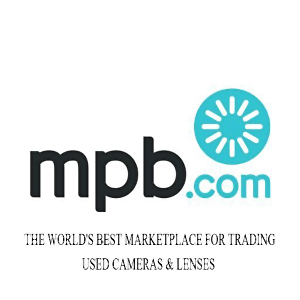 Its organisation against fires, I take to be much better than the metropolitan system." 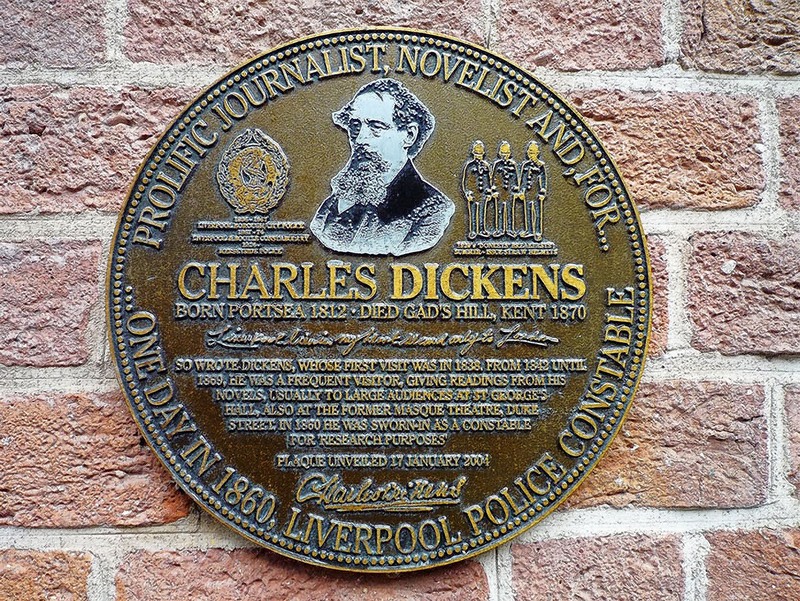 The inscription on the plaque above in Cambel Square reads "Prolific journalist, novelist and, for one day in 1860 Liverpool police constable Charles Dickens born Portsea 1812 died Gad's Hill, Kent 1870 Liverpool lies in my heart second only to London so wrote Dickens, whose first visit was in 1838. From 1842 until 1869, he was a frequent visitor, giving readings from his novels, usually to large audiences at St George's Hall, also at the former Masque Theatre, Duke Street. In 1860 he was sworn in as a constable for 'research purposes'"
In late 1868 Dickens was back in Liverpool appearing at St George's Hall on the 12th, 13th and 14th October and the 26th, 27th, and 28th, where he Read, 'David Copperfield' and 'Mr Chops, the Dwarf" to packed houses. Dickens health was suffering and in late 1868 Dickens agent announced a series of farewell tours for Dickens. He returned to Liverpool for the last time on his farewell tour on the 5th-9th of April, he had planned to book his favourite venue St George's Hall, but the demand for tickets was so great that the venue was change to The Theatre Royal in Williamson Square one of the Reading chose was 'Oliver Twist' and this made his Liverpool Tour a brilliant success. "That Liverpool had never failed him when he had asked the help of her citizens in the cause of literature and benevolence, and that her response had been spontaneous, open handed and munificent." "One of the pleasantest things I have experienced here this time is the way in which I am stopped in the streets by working men who want to shake hands with me, and tell me they know my books."